Espeon continues may series of Eevee and his evolutions. Espeon, along with his sibling Umbreon, were an interesting addition to the possibilities that you can evolve Eevee when Gold and Silver came out. I found it difficult to evolve Eevee to either in the game. For this pattern of Espeon, I adapted by Jolteon pattern to make him. 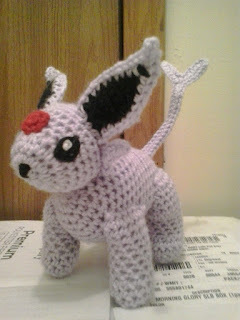 This pattern includes the color lists for Espeon and Shiny Espeon. Worsted Weight Yarn (Shiny colors in parenthesis): Lavender (Spring Green), black, white, and red. Finish off leaving a long tail. Weave tail through sc of Rd 22, pull tightly and secure. Weave in ends. Finish off leaving a long tail. Stuff HIND LEGS firmly. Sew HIND LEGS to BODY. FOLD CHENILLE STEM IN SHAPE OF FORKED TAIL. Rw 1: With lavender, ch 25, working over first prong of forked chenille stem, sc in second ch from hook, sc in next 5 sc, ch 7, working over second prong of forked chenille stem, sc in second ch from hook, sc in next 5 sc, working body of tail of forked chenille stem, sc in side of last sc of first fork, sc in next 18 ch. Finish off leaving a long tail. Insert uncovered chenille stem into BODY. Sew TAIL to BODY. Finish off leaving a long tail. Weave tail through sc of Rd 13, pull tightly and secure. Sew HEAD to BODY through NECK FUR. Rw 11: Holding INNER EAR and OUTER EAR together and working through both thicknesses, ch 1, working up side of EARS, sc in next 10 Rws, 2 sc in free loop of foundation ch, ch 3, sc in second ch from hook, sc in next ch, sc in last sc before ch-3, sc in free loop of foundation ch, working down side of EARS, sc in next 10 Rws. Embroider EYES and NOSE on JOLTEON. Finish off leaving a long tail. Sew FOREHEAD to HEAD. Espeon, Shiny Espeon, Jolteon, Eevee, and Pokemon are copyright Nintendo and their respective creators. This pattern is an original pattern and is © by Christjan Bee (December 2017). Please do not claim this pattern as your own. If you wish to share this pattern, you may link to this pattern but please do not reprint it on your site. You may keep a copy for your own personal use but you may not sell or distribute it, or sell items made from this pattern. Thank you for bringing this to my attention. I fixed the pattern. thank you, i just adore your patterns and check often to see what amazing creations you are sharing with us.